IC3D TechTack is a reusable and lightweight thermoplastic that adapts to whatever shape YOU want. Use IC3D TechTack for costume and propmaking, art, toys, replacement pieces and custom parts - really anything! IC3D TechTack is easy to use - just heat it with hot water, shape it like clay and when it cools, you have a strong and durable plastic item. Unleash the Maker in you with IC3D TechTack! 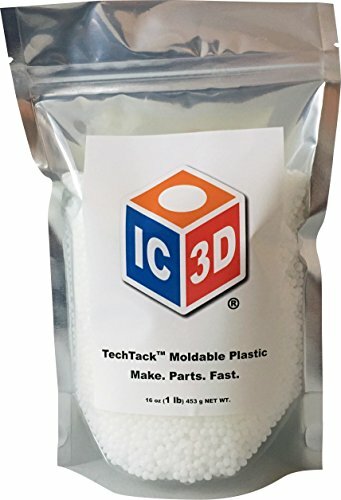 Reusable moldable plastic pellets by IC3D Printers. Make. Parts. Fast. Pour It, Heat It, Form It! If you have any questions about this product by IC3D, contact us by completing and submitting the form below. If you are looking for a specif part number, please include it with your message.